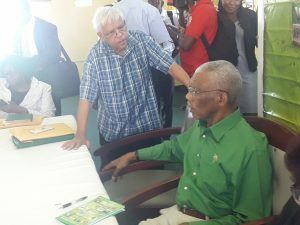 Leader of the Justice for All Party, Chandra Narine Sharma speaking with President David Granger. 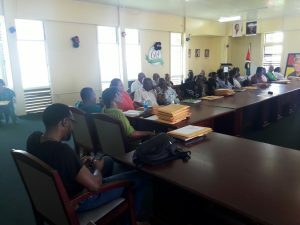 A Partnership for National Unity (APNU) on Friday appeared tight-lipped about the budgeted cost for its upcoming local government elections campaign and said the five political parties under its umbrella do not have to submit candidates, but would be selected by communities. “In terms of cost of campaign and so on, I would not be able to give you that at the moment,” said Amna Ally, General Secretary of the People’s National Congress Reform (PNCR)- the largest and most influential party in APNU-in response to a question that was greeted with audible discomfort by other coalition supporters who were at the press launch held at Congress Place, PNCR headquarters. Nomination Day is September 21 and LGE Day is November 12. Ally said APNU would not be contesting in four of the 80 local authority areas, but no specific reason. The four are one in Region Three (West Demerara/Essequibo Islands), two in Region Six (East Berbice/Corentyne) and one on the East Bank Demerara, but the umbrella grouping would be supporting independent candidates. “Even though that we may contend that we are not participating in four of the areas, we are also giving support to independent candidates who are participating in the elections because not every person is a political animal but we give support to civic groups and to other individuals,” Ally said. 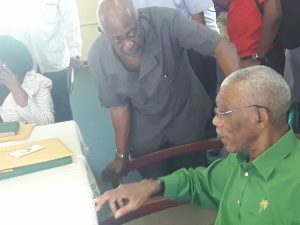 APNU Chairman, President David Granger told the launch of the campaign that “we have support from” the Guyana Action Party (GAP), National Front Alliance (NFA) and the Working People’s Alliance (WPA). “All of the APNU parties, of which there are five, are involved in the campaign,” he said. Leader of the National Front Alliance and President David Granger, who is also Chairman of APNU and Leader of the PNCR. Asked how many candidates would be coming from the individual parties under the APNU umbrella to the various slates for the elections, Granger said the constituencies would have to decide who the candidates would be. “The candidates are selected by the people. We don’t know who the candidates are as yet…They will come forward. They are part of the Partnership and if they are part of the Partnership and they are selected by their constituents, the Partnership will support them. That’s democracy,” he said. Granger made it clear that local government candidates must be prepared to campaign. “What we see here is that in each individual constituency, persons who put themselves up to be elected as candidates need to be able to mobilise members of that community, they need to be able to go door-to-door, house-to-house; they need to be able to conduct registration. This is not a cake walk and people, who do not have that ability or interest will find that their candidacy or campaign will come to a sticky end,” he said in response to a question on why the need for big political organisations or parties should contest local elections. Sources have said that months before talks with the Alliance For Change (AFC) ended with that party deciding to contest the elections its own, the PNCR had been doing the bulk of the work by fanning out across the country for the local elections. APNU’s Local Government Elections campaign managers at the press launch of its campaign. Jaipaul Sharma of the Justice For All Party (JFAP) told Demerara Waves Online News that his party would again not field any candidates in the local government elections instead of submitting nominees and they are all rejected. “I think I rather give the other parties in the coalition an opportunity. We don’t like to fight for positions. I think the PNC struggled long and hard and I think their supporters need to hold positions or else they may dissatisfaction in the camp. A coalition brings heated dissatisfaction,” said Sharma who is Guyana’s Junior Finance Minister. The APNU Chairman, who is also PNCR Leader, hailed the holding of LGE on the constitutionally due date for the second time in almost three years for the involvement of local decision-makers and increased access to public goods such as street lights, potable water supply and all-weather roads ” for the first time in human memory”. Granger, who had often spearheaded picketing demonstrations outside the Presidential Secretariat when the People’s Progressive Party was in office, said local polls marked the end of “obnoxious interim management committees of the previous regime”. The PPP had held local government elections in 1994- two years after winning general elections- but those polls had not been held until the government changed in May 2015. Part of the reason for the delay had been a bipartisan overhaul of the legislation for the local government system. Under the local government system, there are 670 different elections in the towns and neighbourhoods.